You are currently browsing the archives for the english interpreter astana tag. First I would like to give some background information on the International Exhibitions Bureau (BIE) and how it is related to Astana and my work. I am sure that many people have heard of the Universal Exhibition – for example the one for which the Eiffel Tower was built. Something similar but of a smaller scale (not a universal but a so-called recognized exhibition) is planned for 2017 and Astana is bidding to host this exhibition. Astana’s main competitor is Liege (Belgium). The decision on the host country will be made by the end of 2012 and in order to facilitate this decision the Enquiry mission visited both Astana and Liege to see if the cities are able to host several millions of visitors that will come to see the exhibitions. This is how 9 delegates of BIE found themselves in Astana in March, 12-16. It was my job to provide both simultaneous and consecutive translation during the visit. It goes without saying the programme was very tight so I will only mention events in which I was involved myself. March, 11 – arrival day. Organizers of the visit decided to make it an “easy” day for the delegates and use some time before the official part of the visit to introduce guests to the Kazakh culture. That is why the first day was spent in Khan Shatyr, Pyramid and Palace of Independence where guests got a chance to visit the Ethnical Kazakh Village where the Kazakh traditions (including a traditional wedding, dances, jewellery, handcraft, etc) were shown. My main task on that day was to provide simultaneous translation during the presentations aimed at proving that Astana has enough capacity to host the EXPO 2017 – financial, economic, political. March, 13 started with the meeting with the Minister of the Interior Mr.Kassymov at which the political situation in the country was discussed. It was then followed by the excursion to the newly built TV and radio center where we were shown the future news rooms, studios and other facilities of the center. After a number of presentations delegates left for a working lunch with the Minister of Finance and the Minister of Foreign Affairs where I was translating as well. March, 14 was marked by the meeting with the President Mr. Nazarbayev who emphasized the political will to support the idea of EXPO 2017 being held in Astana. The delegates then visited Eurasian National university where a meeting with the Minister of Education and Science, students and academicians was planned. I graduated from this university 2 years ago and it was a very interesting feeling to come back to my alma mater not as a student but as a simultaneous translator. I continued my translation at yet another working lunch, this time with the Mayor of Astana. March, 15 was another day of presentations on the future site of the EXPO and the future use of EXPO facilities since it is very important to invest in something that will last longer than just 3 months of the EXPO. When I wasn’t in a booth doing simultaneous translation, I was down in the conference room to help with the consecutive English-Russian translation. On the March, 16 together with the delegates I left for Almaty where a tour of the city and its surroundings by helicopter was organized. The official visit of the Enquiry mission finished with the internal meeting the results of which will hopefully have a positive impact on the final decision. On the June, 1st I provided interpreter services at the II Korean-Kazakhstani Medical Forum. Representatives of 6 different hospitals flew over to Astana to have a presentation of their achievements in treating cancer, cardiovascular diseases, spine injures, etc. I was assigned to work with Mr. Kyung Woo Park, Deputy Director of the International healthcare center in Seoul National University Hospital. In his presentation Mr. Park touched upon new ways of treatment of ventricular septal defect and other heart diseases: not with the help of bypass surgery but using the percutaneous coronary intervention (PCI). Korean doctors suggested cooperation to their Kazakhstani colleagues, several MOIs were signed and now Kazakhstani patients can be sent to Korea to undergo the necessary treatment. Once the official part of the forum was over, the more interactive one began. Those who were interested could come up to the booths where the hospitals were present and they could ask questions and exchange contact details. It was my first experience in translating at the Medical Forum and I learned a lot while preparing for that assignment. I also got to meet and discuss with many interesting people and I would like to personally thank Mr. Park for all the information that he shared with me. I just got back from Berlin and there is already more work ahead: on February, 28th I provided interpretation services for the National Business Forum in Astana. National Business Forum (NBF) serves as a kind of bridge between government and business, so there were representatives from both sides. Prime Minister Mr.Massimov was the first one to deliver a speech, then there was the panel discussion followed by more discussions at the round tables. 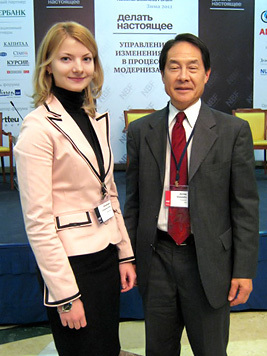 My task was to interpret for Mr. Shinsato, who was invited to the NBF as an international expert. Mr.Shinsato delivered an extremely interesting speech on change management focusing on lean production and kaizen. I really love my job since it allows me to constantly learn from the people I work with. If not for the forum, how would have I found out about kaizen? Having delivered his speech, Mr.Shinsato was actively participating in the discussion, so I was doing what is called „chuchotage“ – a kind of simultaneous interpretation without any special equipment. Interpreter just sits next to a person he/she translates for and does the simultaneous translation while another speaker delivers a speech. The discussions were vivid, participants were active and genuinely interested in the topic, so there was a lot to translate. Mr.Shinsato was also interviewed by a local channel and I translated that as well. It was a real pleasure to translate Mr. Shinsato as he is a very experienced speaker, he attracted and involved the audience, made some jokes and at the same time got his message across, so everybody enjoyed the time with him.